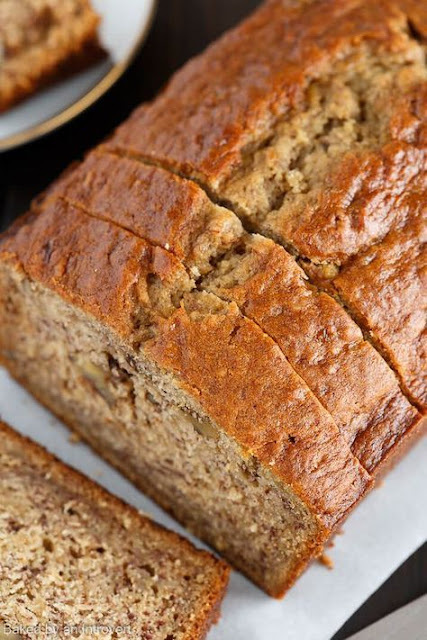 This is honestly the best banana bread recipe ever! 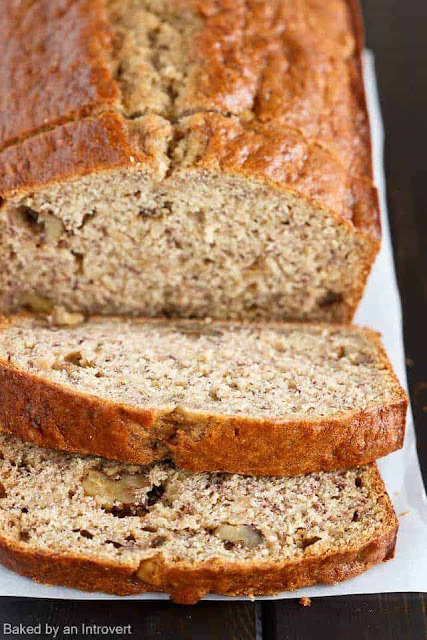 Brown butter, buttermilk, and roasted bananas give this bread the ultimate flavor and texture. Brown butter adds to the nutty sweet flavor while yielding a melt in your mouth texture. Buttermilk adds extra moisture to ensure the bread stays soft and tender. It can easily be enjoyed in place of dessert or for breakfast. It also makes a great snack between meals. Leave bananas in the peel and place them on a foil-lined baking sheet. Bake for 15 minutes. Cool completely. While the bananas are roasting, heat the butter in a small saucepan over medium heat for 2 to 4 minutes, until browned. Set aside to cool. Lightly grease and flour a 9x5-inch loaf pan. Set aside. In a large mixing bowl, combine the butter and sugar. Beat with an electric mixer for 2 minutes until combined. Add the eggs, one at a time, mixing well after each addition. Mix in the vanilla extract. Scrape the bananas out of the peel into a blender and pulse until pureed. You should have about 2 cups of puree. Pour the pureed bananas into the butter mixture and beat until well combined. Add the buttermilk and mix well. The mixture may look curdled. This is normal. In a medium bowl, combine the flour, baking soda, and salt. Stir with a whisk. Add to banana mixture and mix just until the flour is incorporated, taking care not to overwork the batter. Stir in the walnuts if using. Transfer the batter to the prepared pan and bake at 350°F for 45 to 65 minutes until a toothpick inserted into the center comes out with a few dry crumbs. Cool the bread in the pan on a wire rack for 30 minutes. Remove the bread and cool completely on a wire rack. The bread will stay fresh in an airtight container at room temperature for up to 3 days or in the refrigerator for up to 10 days. Baked and cooled bread can be frozen for up to 3 months. Thaw in the refrigerator overnight. Cup measurements are not given for the bananas because they are roasted in their skin. There's no way to measure them before roasting. Choose the largest bananas when shopping for this recipe and you should have great results. Place the roasted banana in the refrigerator to speed up the cooling process. Greek yogurt or sour cream can be used in place of buttermilk. Loosely tent aluminum foil over the bread if the top begins to brown too much before the center is done. 0 Response to "Best Ever Banana Bread"